Recycling is crucial to running a green home. It’s also an easy and effective way to reduce your weekly contribution to the local landfill. • Is wet newspaper recyclable? Paper fibers can only hold so much moisture. If wet paper arrives at the recycling facility, it may not absorb the chemicals needed to process the paper fibers into new products. 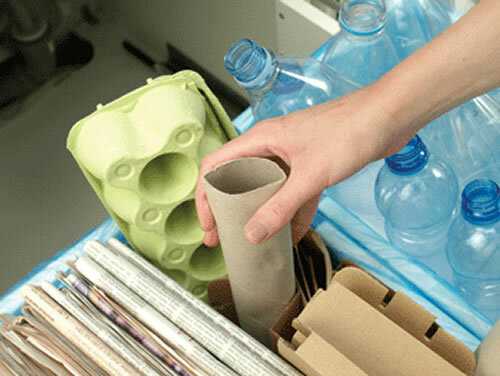 Try to keep recycle-ready paper indoors until pick-up day. • Should you remove plastic bottle caps and wine corks? Corks should be reused or thrown in the trash. Remove plastic caps so you can crush the plastic bottles, making it easy to fit more into the bin. Some caps are recyclable, but recycling centers often discard non-recyclable caps as trash. • Can you recycle items that contained chemicals? Yes, as long as they’re completely empty. An exception is motor oil, because residual oil can interfere with plastics recycling. • Is crushing cans necessary? It’s not necessary to crush cans in preparation for recycling, but doing so makes room in your recycling bin and the transport truck, which means fewer trips to the recycling facility. • How do you recycle batteries and electronics? Many municipalities are now recycling electronics. And some department stores, such as Best Buy, have take-back programs. Visit www.Call2Recycle.org to find your nearest battery take-back location. • Where do recyclables go? After a pick-up, recyclables go to an interim processor called a Materials Recovery Facility. There, they are sorted by machine and by hand using a conveyor belt. Separated recyclables are sent to a processing plant to be made into new products. • Why recycle? Recycling preserves natural resources and is good for the economy, accounting for about one million manufacturing jobs nationwide, and generating more than $100 billion in revenue, according to the Environmental Protection Agency. • What happens to waste that’s not recycled? While some materials may be sent to landfills, the preferred option is an Energy-from-Waste facility, which offers a safe, technologically advanced means of waste disposal that generates clean, renewable energy, reduces greenhouse gas emissions and recycles metal left over in household waste.